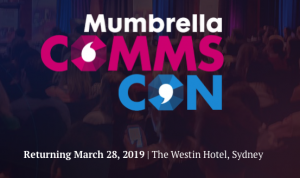 Mumbrella’s CommsCon is the premier event for the PR and communications industry in Australia, with well over 400 delegates attending this year’s record-breaking conference. Each year, industry professionals, both national and international, gather to discuss the biggest challenges and opportunities in the rapidly changing communications landscape. This year’s conference was bookended by two packed out keynotes with Airbnb’s Global PR Lead, Dylan Smith, speaking in the morning and the nbn’s outgoing Chief Corporate Affairs Officer, Karina Keisler, finishing the conference. It’s the not-to-be-missed event for public relations (both agency and in-house), communications, social media and content marketing professionals, plus anyone experimenting in owned and earned channels.